Home » Cameras » How Does A Nokia Lumia 1020 Fare Against A DSLR? 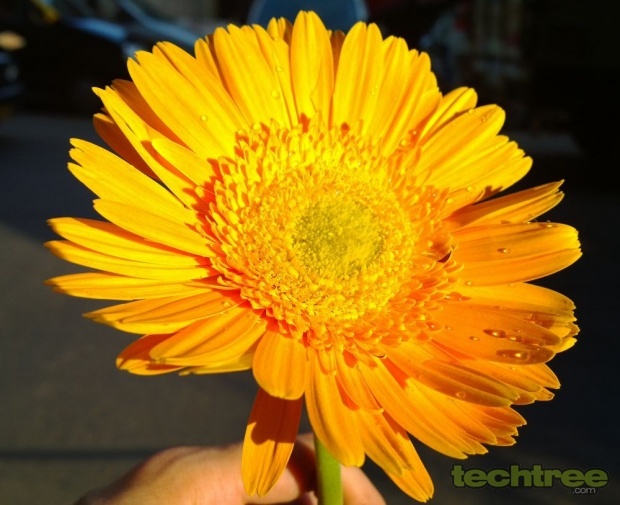 How Does A Nokia Lumia 1020 Fare Against A DSLR? Is the Lumia 1020 an ideal entry-level DSLR replacement? We’ve reviewed how good Nokia 1020 camera is in the past here (video review) and the amazing camera sample shots here. This got my colleague who is an ardent supporter of Nokia 1020 (Nokia Lumia phones in general) and me (I love my DSLR) talking about why bother with a different camera at all when one buys a Nokia 1020. After much fervent arguments and ineloquent dialogues, we decided on a simple test that an actual person who knows nothing about cameras will use. Therefore we had to catch the lowest combination denominator for the Nokia 1020 test. A girl (name withheld for fear of my life) who doesn’t know and doesn’t even care about cameras, all that she wants are good photos (or selfies) that can click by themselves automagically. A Perfect Test! So with a bit of planning, this is what we decided. - Canon EOS-M (18-55mm lens kit) — Unconventional mirrorless camera that has an APS-C sized sensor like a Canon 550D, with a touchscreen in a small compact body. Armed with this, we went ahead to shoot the same shots with as much accuracy as we possibly could. Our first shot is actually one of the most challenging to catch for a camera especially in low light conditions like these. The Nokia 1020 does quite a good job except for the colours which appears washed out. Canon EOS-M captures the colours closest to reality. This could be attributed to the focus of camera itself and the Auto white balance setting in reference to that. Nonetheless, this is the result we landed up with even after clicking multiple times. The Nokia 1020 as well as the Canon EOS-M have caught excellent details. Though the Nokia 1020 does exaggerate colours and therefore is more attractive to watch, the real colours look like as represented by Canon EOS-M.
Again we are in Full-auto here. The Nokia 1020 loves to exaggerate the colours. Check out the red logo behind on the pillar, it actually looks pinkish. Now, for photographers this would generally be a no-no, but honestly this photo will end up being on the phone and max on Facebook for sharing, it looks great overall and a lot more attractive than the EOS-M. After all, I would have to post-process the image to make the colours pop, Nokia 1020 does that job pretty much for you here. Nice! The Nokia 1020 has no optical zoom, where as the Canon EOS-M has 18-55mm a basic optical zoom. But 1020 has high 38MP sensor (+ 5MP as separate image), so we actually have a lot of "cheat" zoom, in other words digital zoom to play and reframe our shot with. No matter what tricks Nokia 1020 has, when you do a proper pixel to pixel comparison, you'll notice noise on the Nokia 1020 and the loss of detail in this evening shade shot. The Nokia 1020 does do digital zoom with a lot of panache though. Evening and morning sunlight is a beautiful golden colour. This can give some beautiful shots but when we clicked with Nokia 1020, our first reaction was anything but beautiful. The Nokia 1020 blew the colours out of proportion, trying to focus on another point on the flower and fiddling with Aperture didn’t fix it, until EV (Exposure value) was brought down to correct this. Canon EOS-M did this beautifully without a blink. This is where Nokia’s 1020 1/1.5 inch sensor VS the Canon’s much bigger EOS-M APS-C sensor is truly tested. The bigger sensor no doubt does a much better job with minimal grain. The Nokia 1020 does do a commendable job but with more grain though; check out the detail it can manage in low light. Impressive! For this test we had one light barely visible on the left side and that too coming from an LCD monitor. While shooting in such a dark environment, poor Nokia 1020 really struggled and we struggled even more as we could not keep the camera steady in such a low light in spite of using the table as a help. Therefore the shot has been taken with faster shutter speed to try and maintain steadiness with shaky hands. Without a Nokia camera grip to assist, these are real life troubles you can expect to have especially in low light, like in a low lit pub or dark corner. Mind you, its low light performance is still better than all other phone cameras that we have tested till date. So what do I think of this little test we conducted? Simple, the Nokia 1020 is a fantastic camera phone. The sensor comes very close to 1 inch sensor cameras such as the Sony RX100 II. But you cannot beat bigger sensor with all your software or camera tricks, period. Where the camera phone excels is obviously the portability and the convenience part, even though Canon EOS-M beats all other DSLR’s in this department due to its compact mirrorless design, it still cannot beat a 1020’s size and convergence excellence. With a little bit of tinkering around, you can take amazing shots with it. Sigh, if only I had that kind of money to burn. To sum it up, the Nokia Lumia 1020 is the best camera phone out there, but it is not good enough to replace a DSLR or cameras with APS-C sized sensors. So spend your 45K wisely depending on what you truly need. Special thanks to our Videographer Khozema Agarwala who enthusiastically contributed to this article.